Angela Helwig is an Occupational Therapist. 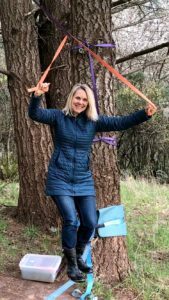 She is a licensed Occupational Therapy, SIPT Certification (Sensory Integration Praxis Test), and recently certified in the Fundamentals of Natural Lifemanship . She has spent the past 20 years working as an OT in a variety of settings and with clients facing different issues. Previously worked at CDRC at OHSU for the past 17 years with a focus on evaluation and treatment of children, young adults, and families dealing with a variety child development and neurological challenges. Angela typically specializes in young children to adults who struggle with self-care/life skills issues, sensory processing disorders, ASD, parent training for children with social/emotional issues, motor learning/coordination problems and with clients with anxiety. Angela loves to spend her time out in nature, in her garden, traveling, taking daily walks with her dog and on family backpack trips where they get some time to enjoy the beauty and peace of nature. She enjoys showing her clients and families how to engaged nature and animals in a therapeutic way at The Center at Heron Hill.